“This governor continues to offer dispassionate cuts to the programs that impact the lives of so many people in this state. I beg the governor to roll up his sleeves and join us at the bargaining table this year. He and his administration need to take a walk in somebody else’s shoes for once, because these cuts do more harm than good to the people we serve. We in the Senate have reached bipartisan support on a number of budgetary issues, and I suggest he join us. Last year, we passed a plan that provided certainty and stability to violence prevention, health care and addiction treatment services, along with programs like Teen Reach. 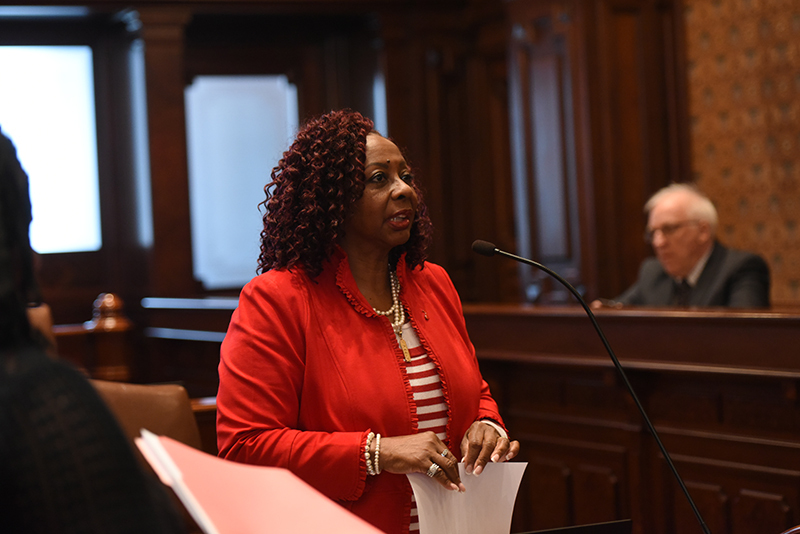 In an effort to protect governmental information from phishing schemes and coordinated cyber-attacks legislation backed by State Senator Mattie Hunter (D- Chicago) was signed into law that will require state employees to take cyber-security training on an annual basis. The initiative was modeled after a Florida law which was enacted to ensure that the state’s data and staff resources are maintained reliably and safely and are recoverable in the event of a disaster. “This legislation will not only improve the accessibility of electronic information and information technology but will increase education, employment and access to governmental information and services,” said Hunter. The legislation becomes effective Jan. 1, 2018. In response to the senseless violence and killing of Xavier Joy and many others, State Senator Mattie Hunter (D-Chicago) is calling for greater commitment to violence prevention, community outreach and youth programs. Xavier Joy, was a former football player at Morehouse College and had worked as a special education classroom assistant in the Chicago Public Schools. Committed to his community, Joy left school and returned to Chicago to work with underprivileged children. His family believes he was gunned down after being robbed for his cellphone.